©Steve Bigley and Courtesy: The Womens Museum: An Institute for the Future, Dallas, Texas, aprons from EllynAnne Geisels collection, color photograph. MYRTLE BEACH, SC.- Vintage aprons will be the focus of an exhibition opening at the Franklin G. Burroughs-Simeon B. Chapin Art Museum Sunday, January 17, 2010. Apron curator EllynAnne Geisel will be on hand at the opening reception (1:30 to 3:30 p.m.) for a gallery talk, giving insights into "Apron Chronicles: A Patchwork of American Recollections", a traveling exhibition from the Womens Museum of Dallas, Texas, which pairs powerful photography with real-world stories and sentimental ties to the past with 155 aprons. The exhibition, which runs through March 19, shares the emotional stories of 46 individuals, ages 13 to 109, who have unique memories about aprons and the people who wore them. 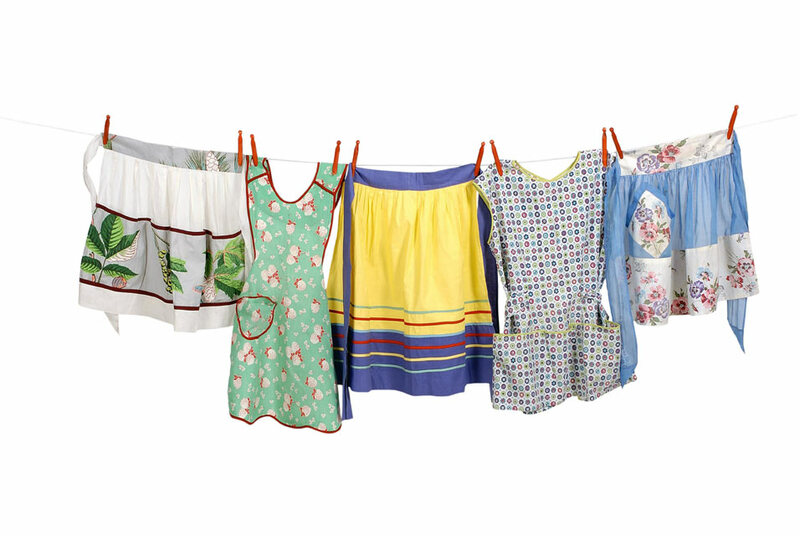 Tuesday morning, January 19, from 10:30 to 11:30 a.m., Geisel will present Apron Memories, a delightful chronology and history of the apron with stories, vintage aprons and her favorite blueberry coconut muffins. Reservations are necessary; call the Art Museum at 238-2510. That afternoon, Geisel will conduct a docent tour of her exhibit at 2 p.m. All events are free and open to the public. In the "Apron Chronicles" Exhibition, portraits taken by award-winning photographer Kristina Loggia are paired with aprons and testimonies collected by writer and curator EllynAnne Geisel to create what Time magazine, in a feature on the exhibition, described as a poetry of the familiar. Among the tales on exhibit is the story of Ada Ashford, who at 92 wears an apron every dayexcept in church, as did her mother who was wearing one when she died. Westerner Ray Moore belies his lank, leathery appearance with tender memories of his grandmother cradling freshly gathered eggs in her apron, and Millie Lesar worked 63 years as a waitress, tucking her tips into an apron pocket until she could buy herself a refrigerator. During her first 24 years as a homemaker Geisel never wore an apron until 1999, when she purchased an apron as inspiration for an article she was writing. Since that time she has collected more than 300 aprons from all over America and chronicled as many memories. She is the author of 'The Apron Book', (2006), which is considered the quintessential apron resource, as well as 'Apronisms', (2008) and 'The Kitchen Linens Book', (2009). Geisel, who is North Carolina born and attended college in South Carolina, resides in Pueblo, Colorado. Loggia, who once served as a war photographer, was awarded first prize in 2005 for her Apron Chronicles portrait of Ada Ashford by the National Press Photographers Association in the Magazine Portrait and Personality category. She is the daughter of noted actor Robert Loggia. Also on display at the Museum is "Milestones: Celebrating 70 and Beyond" which runs January 17 through April 25.